A First Federal savings account is a great way to plan for your future. Take a look at our options and see which one is right for you. With a Regular Savings account from First Federal, you can save and earn interest while you do it. Our tiered interest rates can reward you more when you carry higher balances, and with no monthly service charge, you can watch your savings grow. Our Kids Ca$h Savings account is designed to help kids get started with the healthy financial habit of saving. First Federal will contribute $5 toward the $10 minimum opening deposit, making it easy and rewarding for them to get started. Put your savings to work for you with an MMDA Plus account from First Federal. While earning tiered interest like our Savings Plus account, our MMDA Plus also gives you the ability to write checks directly from your account and a debit card is available. With an Idaho Medical Savings Account from First Federal, you can save money towards qualifying medical expenses, and earn interest at the same time. These accounts can also have certain tax benefits associated with them, and have no monthly service charge if minimum balances are met. If you’re covered by a High Deductible Health Plan, you may be eligible for a First Federal Health Savings Account. These accounts let you save money towards qualifying medical expenses, allow you to write checks, and offer great tax benefits. Add tiered interest earnings on your savings, along with no monthly service charge and an available debit card, and our Health Savings Account is a great fit. 1 All savings accounts are limited to 6 total withdrawals per statement cycle by pre-authorized, automatic, computer, telephone transfer, or check (if applicable). A $10.00 fee will be charged for each transaction in excess of the limit. You must maintain a minimum daily balance of $5 to earn APY. 2 Tax implications of health-related savings products can vary depending on your individual tax situation. Please consult a tax professional for specifics on how these products will impact your tax liability. 3 Must maintain $100 minimum daily balance to avoid $3 monthly service charge. Point - Snap - Deposit! 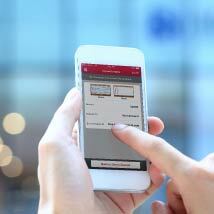 Use First Fed's app to remotely deposit a check without going to the bank. It's as easy as taking a picture!